People have been enslaving one another ever since the first caveman with bullyish tendencies made a daily habit out of forcing other cavemen to take up his share of the hunting and gathering, and the practice has continued unabated ever since. For most of human history, outright ownership of a person was considered as normal as, say, a mortgage or a student loan debt, leading to a casual acceptance that we enlightened folks of later generations profess to never being able to understand. The thing is, we do understand slavery – despite (and because of) countless centuries of shifting forms and changing perceptions, its central tenets of power and control are more or less hard-wired into our socioeconomic realities. In the great scheme of things, the development of writing comes much later than the first moves away from the ledger-spurning life of the nomadic hunter/gatherer. Since “history” has traditionally been described as the written record of humankind, it’s that particular advancement that marks the boundary of “prehistory.” Thus, by definition, there’s not much in the way of records of slavery among the prehistoric settled peoples of say, Mohenjo-Daro or Catal Hayak, but we can be relatively certain that the practice was at least being considered at that early date. By the time people started writing stuff down, there was already in place a large body of precedent and tradition surrounding the ownership of people. 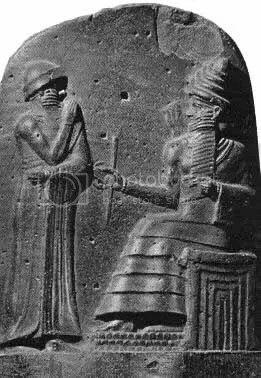 Hammurabi, though he styled himself “the exalted prince, who feared God, to bring about the rule of righteousness in the land, to destroy the wicked and the evil-doers; so that the strong should not harm the weak; so that I should rule over the black-headed people like Shamash, and enlighten the land, to further the well-being of mankind,” credited the god Anu with being the source of the Code. Of course, by the relatively late date of Hammurabi’s reign, people had been using the perceived will of deities to justify enslavement for hundreds of years – but even older were the economic rationales. 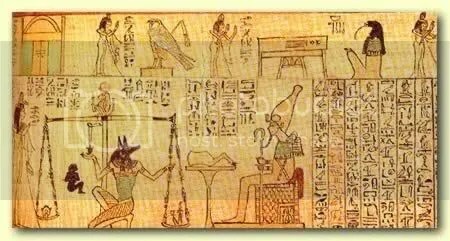 Hem (Hm), generally translated as ‘slave’ and originally meaning body, was seemingly a person with lessened rights dedicated to a certain task such as the service of a god (since the 1st dynasty) or the royal administration. The hemu are mentioned in the context of private persons only since the end of the Old Kingdom. Since the Middle Kingdom foreign slaves mainly from Asia became increasingly numerous. They were either prisoners of war or traded by slave merchants. 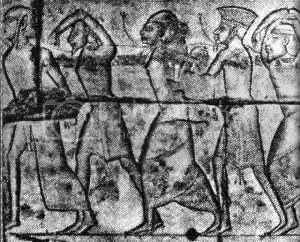 Their period of enslavement in Egypt was often limited. Debt slaves or prisoners of war were at times set free after serving for a certain period. Slavery was also apparently used to allow convicted criminals to repay their debts to society; in especially egregious cases, the vizier was empowered to carry out a sentence of perpetual forced labor. Still, given the deterrent nature of the type of justice imposed at the time, it seems pretty unlikely that the Egyptians would be able to count of large groups of convicts to build things like the Temple at Carnac, and not infrequently they reinterpreted their own laws to meet the demands of the marketplace. I bequeath to the Citizeness Ineksenedjem, the woman who is in my house, all that I have acquired with her, namely, two male servants and two female servants, total 4, and their children. The will of Amenkhau, c.1100 BCE, via ibid. Prices for slaves changed with economic circumstance, but by the time the Romans had grown powerful enough to exert an influence in Egypt, about 1 in 6 households there owned at least one. 41 kit of silver – about 370 grams – was deemed a good price for a Syrian girl by a guy named Inry-nofret, who (depending on a given pharaoh’s economic plan and fortunes in war) might have used the same amount of cash to get two male slaves. Inry-nofret bought his servant in a deal made on the street, which seems typical for the Egyptian form of ancient slavery – it would be the ultra-efficient Romans that would introduce the idea of a public slave market. As many economists and evil right wing thugs have pointed out of the centuries, the less a person is obligated to spend on labor costs, the grander can be the monuments he builds for himself. This lesson was not lost on the kings and queens of Egypt, who occasionally accepted (or compelled) the vassalage of entire peoples, then used them to construct massive public works projects or mine copper in horrific hellholes in Nubia and the Sinai. 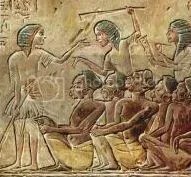 Though some governments paid tribute to the pharaoh in the form of slaves, other peoples were absorbed into the Egyptian mainstream wholesale as a result of outright conquest. … I carried away those whom my sword spared, as numerous captives, pinioned like birds before my horses, their wives and their children by the ten-thousand, their cattle in number like hundred-thousands…..
Historiorant: Settle down, Rummy. Just settle down. I have not domineered over slaves. I have not vilified a slave to his master. And Tapmut and her daughter Yehoyishma’ declared: We shall serve you [a]s a son or daughter supports his or her father as long as you live; and when you die, we shall support your son Zakkur like a son who supports his father, just as we shall have been doing for you while you were alive. This attitude was admired and encouraged by the Hellenistic Greeks who muscled their way in after Alexander pushed out the Persians. 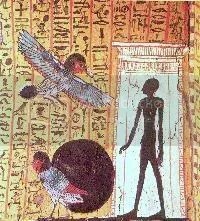 It’s also worth pointing out that since manumission – the release of a slave to his/her own recognizance – had certain soul-cleansing benefits in Egyptian cosmology, it seems to have been something of a deathbed practice at various times. Of course, in the early days, the mummies of kings were interred with those of their killed-so-they-can-serve-forever servants, but that practice ended when it was discovered that clay mockups would work just as well. 26 And Judah said unto his brethren: What profit is it if we slay our brother and conceal his blood? 27 Come and let us sell him to the Ishmeelites, and not let our hands be upon him; for he is our brother and our flesh. And his brethren were content. Genesis 37; 26-27, via ibid. The ancient Israelites, like everyone else in that part of the world, practiced slavery of different sorts and types. Treaties obligated the extradition of escaped slaves, and laws made owners responsible for the compensation of third parties injured by the actions of a slave. Exodus 21:20 tells us it was okay to beat a slave, but if you went all Alberto Gonzales on him, he might be compensated with freedom via Ex. 21:26-27. Both Exodus and Deuteronomy give slaves the Sabbath off, and things were generally better for Hebrew debt-slaves than POWs – again, Exodus and Deuteronomy provide the terms of the covenant. 8 King Zedekiah, his officials, and everyone else in Jerusalem made an agreement to free all Hebrew men and women who were slaves. No Jew would keep another as a slave. And so, all the Jewish slaves were given their freedom. 13 I am the Lord God of Israel, and I made an agreement with your ancestors when I brought them out of Egypt, where they had been slaves. 14 As part of this agreement, you must let a Hebrew slave go free after six years of service. Your ancestors did not obey me, 15 but you decided to obey me and do the right thing by setting your Hebrew slaves completely free. You even went to my temple, and in my name you made an agreement to set them free. But you have abused my name, because you broke your agreement and forced your former slaves back into slavery. 17 You have disobeyed me by not giving your slaves their freedom. So I will give you freedom–the freedom to die in battle or from disease or hunger. I will make you disgusting to all other nations on earth. 18 You asked me to be a witness when you made the agreement to set your slaves free. And as part of the ceremony you cut a calf into two parts, then walked between the parts. But you people of Jerusalem have broken that agreement as well as my agreement with Israel. So I will do to you what you did to that calf. 19 I will let your enemies take all of you prisoner, including the leaders of Judah and Jerusalem, the royal officials, the priests, and everyone else who walked between the two parts of the calf. These enemies will kill you and leave your bodies lying on the ground as food for birds and wild animals. “I do solemnly swear that I will faithfully execute the office of President of the United States, and will to the best of my ability, preserve, protect and defend the Constitution of the United States.” And you added “so help me, God” like just about all the others, right? Perhaps not surprisingly, the Greeks did a lot of thinking about their slaves. The Athenians were always trying to categorize them – pin down their exact legal status and such – while others, like the Spartans, spent most of the time terrified that the overwhelming numerical advantage the slaves held over them would one day be their downfall (it almost was, on several occasions). Slaves were intimately tied to the economies of some of the other great ancient poli, as well: around 20 CE, Strabo reported that 500 years earlier, “Not every man is fit for the voyage to Corinth” – a reference to the temple prostitutes that enticed visiting sailors to spend every last drachma in their pockets. If, gentlemen of the jury, you will turn over in your minds the question what is the difference between being a slave and being a free man, you will find that the biggest difference is that the body of a slave is made responsible for all his misdeeds, whereas corporal punishment is the last penalty to inflict on a free man. The master is only the master of the slave; he does not belong to him, whereas the slave is not only the slave of his master, but wholly belongs to him. Hence we see what is the nature and office of a slave; he who is by nature not his own but another’s man, is by nature a slave; and he may be said to be another’s man who, being a human being, is also a possession. And a possession may be defined as an instrument of action, separable from the possessor. But is there any one thus intended by nature to be a slave, and for whom such a condition is expedient and right, or rather is not all slavery a violation of nature? There is no difficulty in answering this question, on grounds both of reason and of fact. For that some should rule and others be ruled is a thing not only necessary, but expedient; from the hour of their birth, some are marked out for subjection, others for rule….Again, the male is by nature superior, and the female inferior; and the one rules, and the other is ruled; this principle, of necessity, extends to all mankind. Others, clinging, as they think, simply to a principle of justice (for law and custom are a sort of justice), assume that slavery in accordance with the custom of war is justified by law, but at the same moment they deny this. For what if the cause of the war be unjust? And again, no one would ever say he is a slave who is unworthy to be a slave. Were this the case, men of the highest rank would be slaves and the children of slaves if they or their parents chance to have been taken captive and sold. Wherefore Hellenes do not like to call Hellenes slaves, but confine the term to barbarians. Yet, in using this language, they really mean the natural slave of whom we spoke at first; for it must be admitted that some are slaves everywhere, others nowhere. The same principle applies to nobility. Hellenes regard themselves as noble everywhere, and not only in their own country, but they deem the barbarians noble only when at home, thereby implying that there are two sorts of nobility and freedom, the one absolute, the other relative. Sparta’s slave experience involved a little less soul-searching and a lot more liberty-restricting self-defense than that of Athens. In 725 BCE, the Spartans, seeking to feed themselves and have someone else do the farming, marched over a nearby mountain range (there’s a lot of those in Greece) and conquered the Messeneans, who occupied a nice, fertile plain. Things worked out okay for Sparta until 640 BCE, when the city-state of Argos encouraged the Messeneans (now called “helots”) to revolt; Sparta barely survived. In response to the need to hold this territory and the keep an iron sandal on the throats of the untrustworthy helots, Spartan society began the shift toward militarism for which it is so famous for today. The ideology of Sparta was oriented around the state. The individual lived (and died) for the state. Their lives were designed to serve the state from their beginning to the age of sixty. The combination of this ideology, the education of Spartan males, and the disciplined maintenance of a standing army gave the Spartans the stability that had been threatened so dramatically in the Messenean revolt. Paradoxically, this soldier-centered state was the most liberal state in regards to the status of women. While women did not go through military training, they were required to be educated along similar lines. The Spartans were the only Greeks not only to take seriously the education of women, they instituted it as state policy. This was not, however, an academic education (just as the education of males was not an academic education); it was a physical education which could be grueling. Infant girls were also exposed to die if they were judged to be weak; they were later subject to physical and gymnastics training. This education also involved teaching women that their lives should be dedicated to the state. In most Greek states, women were required to stay indoors at all times (though only the upper classes could afford to observe this custom); Spartan women, however, were free to move about, and had an unusual amount of domestic freedom for their husbands, after all, didn’t live at home. The madness and anticipation surrounding the elections is palpable around here, so I want to extend my thanks and congratulations to anyone who made all the way through this without clicking on to the front page and refreshing (that doesn’t mean I don’t greatly appreciate all you hotlisters, though!). As this election season has shown, we as a site are at our best when we use our individual talents to further the goals of the group. Me, I write history – so let my community contribution be the Cave of the Moonbat as a place to relax, recharge, and think about what we’re fighting for in the grandest of senses. And if I might beg the gentle reader’s indulgence, you ought to check out Swordsmith‘s diary from yesterday: Rove: The Role-Playing Game, which I helped to write as part of an ongoing project for the Wildside Gaming System, is not your teen year’s D&D. This entry was posted on Saturday, October 6th, 2007 at 8:06 am and is filed under Uncategorized. You can follow any responses to this entry through the RSS 2.0 feed. Responses are currently closed, but you can trackback from your own site.